Tucked away in the Science Building is an astonishing collection of plant specimens. Some samples date as far back as 1861, others come from as far away as Florida, Quebec, and even Albania. “They just wait here for someone to come and use them,” said Jim Battaglia, visiting research associate of biology. Battaglia has made it his business to double the collection housed in the college's Eckert Herbarium. The late Theodore Eckert, professor emeritus of biology, founded the herbarium, was its first curator, and provided its original collection. Daniel Potts, associate professor of biology, is the current director. Plain metal cabinets house nearly 10,000 specimens—including mushrooms, sedges, common wildflowers, and orchids—gathered by amateurs, students, scientists, and botanists. Because the practice of creating a specimen sheet has long required detailed documentation, each carefully mounted plant—many with roots, most with flowers and seeds—tells a story. One Edna Boyd mounted a light purple flower commonly known as cranesbill, noting that she had found it on May 25, 1900, most likely near Fredonia, Pennsylvania. The Dr. James D. Haynes Mycological Collection features thousands of specimens of fungi. In 2010, the herbarium was selected to house a collection from the Lake Erie Coast Project, a survey of the Canadian shore of Lake Erie from Fort Erie to the Grand River. Recently, Battaglia acquired a collection (pictured at left) of 215 sheets dating back to 1869 created by George Hutchins Thomas, a student at Massachusetts Agricultural College (now University of Massachusetts, Amherst). Battaglia, a retired English teacher, became interested in plants in the 1980s and has been a member of the Niagara Frontier Botanical Society for many years. 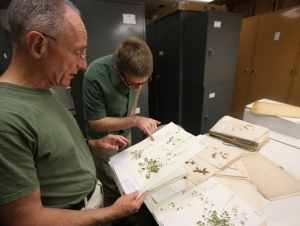 He found his way to Buffalo State in 2006 through Javier Peñalosa, associate professor emeritus of biology, a plant ecologist who retired from the department in 2007, and took on the task of organizing some 40 years’ worth of collections, representing about 5,000 specimens. Along the way, new collections were acquired, including Battaglia’s own lichen specimens, and the number has doubled. “This may be the biggest unknown collection at Buffalo State,” said Battaglia. “I want people to come and use it—that’s what a herbarium is for.” He envisions the collection as a resource not only for scientists but also for artists and designers looking for inspiration. Leaves tiny as sparrow footprints, slivers of colors bisecting flower petals, stems arching over or reaching skyward, roots like tangled baby hair, seed coverings brown and thick still protecting the embryonic plant within provide valuable data while illustrating an endless variety of pattern, shape, and color. 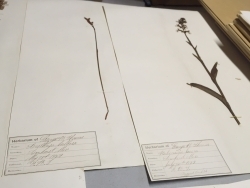 To see the collection, or to learn more about the Eckert Herbarium, stop in to Science Building 250A on Thursday from 9:00 a.m. to noon. To make an appointment, please e-mail Shannon Casterline, instructional support technician for the department.